I nod and take his hand. When my fingers touch his palm, vibrations trickle up and down my skin. And I thought his voice made me into a tuning fork. "You care now. I've made it to the small circle of people that you care about, and that's a very privileged place to be." My throat constricts, and even though I try to speak, I can barely breathe. He smiles at me gently. "And you've broken into mine." Even though it's so late, people are up, living life, or maybe even watching Doctor Who reruns on Netflix, like I was. And just when I thought I no longer believed in magic. I blink hard and shake my head, but the image of the young man with an owl on his shoulder doesn't go away. They remain, walking in and out of the shadows. My first thought about this book was look at that cover! I know, you shouldn't judge a book by its cover, but let's be honest, we all look at pretty covers. So, then I read the description and it sounded like it would be a great read. Well, it was. I really enjoyed it. It was about ghosts and hauntings. It was light so people could still read it without being afraid to turn out the lights. Pauline Creeden's writing is good. There were times that it was a little repetitive, like she would use the same phrase a few times, but she kept me reading, which is the ultimate goal. If a writer keeps me reading, that means they're doing something right. And I believe that Pauline's writing will only get better. The main character in this book is Chira Kelly. I liked her. I related to her a lot. She was a nerd who loves Doctor Who. Within the first chapter, I knew I was going to like Chira as soon as she said she was watching Doctor Who reruns on Netflix. Her best friend is Tasha and I liked her too. There was a rumor that went around they're school that they were lovers but they weren't. But because of that rumor and a few other problems, Chira led her life as an outcast. 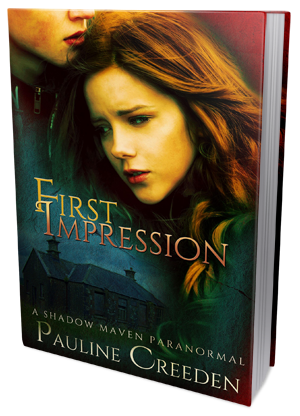 First Impression was a great first book in this series and I will definitely be checking out the next one. The only thing that I wish First Impression had was more of a creep factor. I was hoping to be a little spooked but I wasn't really creeped out a whole lot. So, I hope the next one has a little more scare factor in it!